Chart of the Morse code 26 letters and 10 numerals. The International Morse Code encodes the 26 English letters A through Z, some non-English letters, the Arabic numerals and a small set of punctuation and procedural signals (prosigns). There is no distinction between upper and lower case letters. Each Morse code symbol is formed by a sequence of dots and dashes. The dot duration is the basic unit of time measurement in Morse code transmission. The duration of a dash is three times the duration of a dot. Each dot or dash within a character is followed by period of signal absence, called a space, equal to the dot duration. The letters of a word are separated by a space of duration equal to three dots, and the words are separated by a space equal to seven dots. To increase the efficiency of encoding, Morse code was designed so that the length of each symbol is approximately inverse to the frequency of occurrence in text of the English language character that it represents. Thus the most common letter in English, the letter "E", has the shortest code: a single dot. Because the Morse code elements are specified by proportion rather than specific time durations, the code is usually transmitted at the highest rate that the receiver is capable of decoding. The Morse code transmission rate (speed) is specified in groups per minute, commonly referred to as words per minute. Morse code is usually transmitted by on-off keying of an information carrying medium such as electric current, radio waves, visible light or sound waves. The current or wave is present during time period of the dot or dash and absent during the time between dots and dashes. Morse code can be memorized, and Morse code signalling in a form perceptible to the human senses, such as sound waves or visible light, can be directly interpreted by persons trained in the skill. Because many non-English natural languages use other than the 26 Roman letters, Morse alphabets have been developed for those languages. Early in the nineteenth century, European experimenters made progress with electrical signaling systems, using a variety of techniques including static electricity and electricity from Voltaic piles producing electrochemical and electromagnetic changes. These numerous ingenious experimental designs were precursors to practical telegraphic applications. Following the discovery of electromagnetism by Hans Christian Ørsted in 1820 and the invention of the electromagnet by William Sturgeon in 1824, there were developments in electromagnetic telegraphy in Europe and America. Pulses of electric current were sent along wires to control an electromagnet in the receiving instrument. Many of the earliest telegraph systems used a single-needle system which gave a very simple and robust instrument. However, it was slow, as the receiving operator had to alternate between looking at the needle and writing down the message. In Morse code, a deflection of the needle to the left corresponded to a dot and a deflection to the right to a dash. By making the two clicks sound different with one ivory and one metal stop, the single needle device became an audible instrument, which led in turn to the Double Plate Sounder System. The American artist Samuel F. B. Morse, the American physicist Joseph Henry, and Alfred Vail developed an electrical telegraph system. It needed a method to transmit natural language using only electrical pulses and the silence between them. Around 1837, Morse, therefore, developed an early forerunner to the modern International Morse code. William Cooke and Charles Wheatstone in England developed an electrical telegraph that used electromagnets in its receivers. They obtained an English patent in June 1837 and demonstrated it on the London and Birmingham Railway, making it the first commercial telegraph. Carl Friedrich Gauss and Wilhelm Eduard Weber (1833) as well as Carl August von Steinheil (1837) used codes with varying word lengths for their telegraphs. In 1841, Cooke and Wheatstone built a telegraph that printed the letters from a wheel of typefaces struck by a hammer. The Morse system for telegraphy, which was first used in about 1844, was designed to make indentations on a paper tape when electric currents were received. 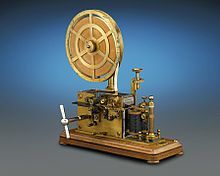 Morse's original telegraph receiver used a mechanical clockwork to move a paper tape. When an electrical current was received, an electromagnet engaged an armature that pushed a stylus onto the moving paper tape, making an indentation on the tape. When the current was interrupted, a spring retracted the stylus and that portion of the moving tape remained unmarked. 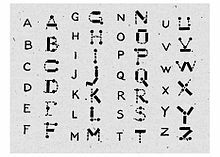 Morse code was developed so that operators could translate the indentations marked on the paper tape into text messages. In his earliest code, Morse had planned to transmit only numerals and to use a codebook to look up each word according to the number which had been sent. However, the code was soon expanded by Alfred Vail in 1840 to include letters and special characters so it could be used more generally. Vail estimated the frequency of use of letters in the English language by counting the movable type he found in the type-cases of a local newspaper in Morristown. The shorter marks were called "dots" and the longer ones "dashes", and the letters most commonly used were assigned the shorter sequences of dots and dashes. This code was used since 1844 and became known as Morse landline code or American Morse code. In the original Morse telegraphs, the receiver's armature made a clicking noise as it moved in and out of position to mark the paper tape. The telegraph operators soon learned that they could translate the clicks directly into dots and dashes, and write these down by hand, thus making the paper tape unnecessary. When Morse code was adapted to radio communication, the dots and dashes were sent as short and long tone pulses. It was later found that people become more proficient at receiving Morse code when it is taught as a language that is heard, instead of one read from a page. To reflect the sounds of Morse code receivers, the operators began to vocalize a dot as "dit", and a dash as "dah". Dots which are not the final element of a character became vocalized as "di". For example, the letter "c" was then vocalized as "dah-di-dah-dit". Morse code was sometimes facetiously known as "iddy-umpty" and a dash as "umpty", leading to the word "umpteen". The Morse code, as it is used internationally today, was derived from a much refined proposal by Friedrich Clemens Gerke in 1848 that became known as the "Hamburg alphabet" . It was adopted by the Deutsch-Österreichischer Telegraphenverein (German-Austrian Telegraph Society) in 1851. This finally led to the International Morse code in 1865. In the 1890s, Morse code began to be used extensively for early radio communication before it was possible to transmit voice. In the late 19th and early 20th centuries, most high-speed international communication used Morse code on telegraph lines, undersea cables and radio circuits. In aviation, Morse code in radio systems started to be used on a regular basis in the 1920s. Although previous transmitters were bulky and the spark gap system of transmission was difficult to use, there had been some earlier attempts. In 1910, the US Navy experimented with sending Morse from an airplane. That same year, a radio on the airship America had been instrumental in coordinating the rescue of its crew. Zeppelin airships equipped with radio were used for bombing and naval scouting during World War I, and ground-based radio direction finders were used for airship navigation. Allied airships and military aircraft also made some use of radiotelegraphy. However, there was little aeronautical radio in general use during World War I, and in the 1920s, there was no radio system used by such important flights as that of Charles Lindbergh from New York to Paris in 1927. Once he and the Spirit of St. Louis were off the ground, Lindbergh was truly alone and incommunicado. On the other hand, when the first airplane flight was made from California to Australia in 1928 on the Southern Cross, one of its four crewmen was its radio operator who communicated with ground stations via radio telegraph. Radiotelegraphy using Morse code was vital during World War II, especially in carrying messages between the warships and the naval bases of the belligerents. Long-range ship-to-ship communication was by radio telegraphy, using encrypted messages because the voice radio systems on ships then were quite limited in both their range and their security. Radiotelegraphy was also extensively used by warplanes, especially by long-range patrol planes that were sent out by those navies to scout for enemy warships, cargo ships, and troop ships. In addition, rapidly moving armies in the field could not have fought effectively without radiotelegraphy because they moved more rapidly than telegraph and telephone lines could be erected. This was seen especially in the blitzkrieg offensives of the Nazi German Wehrmacht in Poland, Belgium, France (in 1940), the Soviet Union, and in North Africa; by the British Army in North Africa, Italy, and the Netherlands; and by the U.S. Army in France and Belgium (in 1944), and in southern Germany in 1945. A U.S. Navy Morse Code training class in 2015. The sailors will use their new skills to collect signals intelligence. Morse code was used as an international standard for maritime distress until 1999 when it was replaced by the Global Maritime Distress Safety System. When the French Navy ceased using Morse code on January 31, 1997, the final message transmitted was "Calling all. This is our last cry before our eternal silence." In the United States the final commercial Morse code transmission was on July 12, 1999, signing off with Samuel Morse's original 1844 message, "What hath God wrought", and the prosign "SK". As of 2015, the United States Air Force still trains ten people a year in Morse. The United States Coast Guard has ceased all use of Morse code on the radio, and no longer monitors any radio frequencies for Morse code transmissions, including the international medium frequency (MF) distress frequency of 500 kHz. However, the Federal Communications Commission still grants commercial radiotelegraph operator licenses to applicants who pass its code and written tests. Licensees have reactivated the old California coastal Morse station KPH and regularly transmit from the site under either this Call sign or as KSM. Similarly, a few US Museum ship stations are operated by Morse enthusiasts. Morse code speed is measured in words per minute (wpm) or characters per minute (cpm). Characters have differing lengths because they contain differing numbers of dots and dashes. Consequently, words also have different lengths in terms of dot duration, even when they contain the same number of characters. For this reason, a standard word is helpful to measure operator transmission speed. "PARIS" and "CODEX" are two such standard words. Operators skilled in Morse code can often understand ("copy") code in their heads at rates in excess of 40 wpm. International contests in code copying are still occasionally held. In July 1939 at a contest in Asheville, North Carolina in the United States Ted R. McElroy set a still-standing record for Morse copying, 75.2 wpm. William Pierpont N0HFF also notes that some operators may have passed 100 wpm. By this time, they are "hearing" phrases and sentences rather than words. The fastest speed ever sent by a straight key was achieved in 1942 by Harry Turner W9YZE (d. 1992) who reached 35 wpm in a demonstration at a U.S. Army base. To accurately compare code copying speed records of different eras it is useful to keep in mind that different standard words (50 dot durations versus 60 dot durations) and different interword gaps (5 dot durations versus 7 dot durations) may have been used when determining such speed records. For example, speeds run with the CODEX standard word and the PARIS standard may differ by up to 20%. Today among amateur operators there are several organizations that recognize high-speed code ability, one group consisting of those who can copy Morse at 60 wpm. Also, Certificates of Code Proficiency are issued by several amateur radio societies, including the American Radio Relay League. Their basic award starts at 10 wpm with endorsements as high as 40 wpm, and are available to anyone who can copy the transmitted text. Members of the Boy Scouts of America may put a Morse interpreter's strip on their uniforms if they meet the standards for translating code at 5 wpm. Morse code has been in use for more than 160 years—longer than any other electrical coding system. What is called Morse code today is actually somewhat different from what was originally developed by Vail and Morse. The Modern International Morse code, or continental code, was created by Friedrich Clemens Gerke in 1848 and initially used for telegraphy between Hamburg and Cuxhaven in Germany. Gerke changed nearly half of the alphabet and all of the numerals, providing the foundation for the modern form of the code. After some minor changes, International Morse Code was standardized at the International Telegraphy Congress in 1865 in Paris and was later made the standard by the International Telecommunication Union (ITU). Morse's original code specification, largely limited to use in the United States and Canada, became known as American Morse code or railroad code. American Morse code is now seldom used except in historical re-enactments. Cayo Largo Del Sur VOR-DME. In aviation, pilots use radio navigation aids. To ensure that the stations the pilots are using are serviceable, the stations transmit a set of identification letters (usually a two-to-five-letter version of the station name) in Morse code. Station identification letters are shown on air navigation charts. 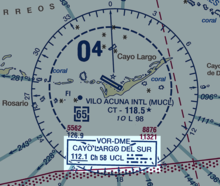 For example, the VOR-DME based at Vilo Acuña Airport in Cayo Largo del Sur, Cuba is coded as "UCL", and UCL in Morse code is transmitted on its radio frequency. In some countries, during periods of maintenance, the facility may radiate a T-E-S-T code (▄▄▄▄▄▄▄▄▄▄▄▄▄▄▄▄▄▄▄▄▄) or the code may be removed which tells pilots and navigators that the station is unreliable. In Canada, the identification is removed entirely to signify the navigation aid is not to be used. In the aviation service, Morse is typically sent at a very slow speed of about 5 words per minute. In the U.S., pilots do not actually have to know Morse to identify the transmitter because the dot/dash sequence is written out next to the transmitter's symbol on aeronautical charts. Some modern navigation receivers automatically translate the code into displayed letters. International Morse code today is most popular among amateur radio operators, in the mode commonly referred to as "continuous wave" or "CW". (This name was chosen to distinguish it from the damped wave emissions from spark transmitters, not because the transmission is continuous.) Other keying methods are available in radio telegraphy, such as frequency shift keying. The original amateur radio operators used Morse code exclusively since voice-capable radio transmitters did not become commonly available until around 1920. 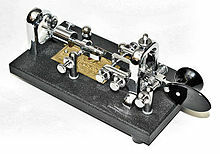 Until 2003, the International Telecommunication Union mandated Morse code proficiency as part of the amateur radio licensing procedure worldwide. However, the World Radiocommunication Conference of 2003 made the Morse code requirement for amateur radio licensing optional. Many countries subsequently removed the Morse requirement from their licence requirements. Until 1991, a demonstration of the ability to send and receive Morse code at a minimum of five words per minute (wpm) was required to receive an amateur radio license for use in the United States from the Federal Communications Commission. Demonstration of this ability was still required for the privilege to use the HF bands. Until 2000, proficiency at the 20 wpm level was required to receive the highest level of amateur license (Amateur Extra Class); effective April 15, 2000, the FCC reduced the Extra Class requirement to five wpm. Finally, effective on February 23, 2007, the FCC eliminated the Morse code proficiency requirements from all amateur radio licenses. Many amateur radio repeaters identify with Morse, even though they are used for voice communications. Through May 2013, the First, Second, and Third Class (commercial) Radiotelegraph Licenses using code tests based upon the CODEX standard word were still being issued in the United States by the Federal Communications Commission. The First Class license required 20 WPM code group and 25 WPM text code proficiency, the others 16 WPM code group test (five letter blocks sent as simulation of receiving encrypted text) and 20 WPM code text (plain language) test. It was also necessary to pass written tests on operating practice and electronics theory. A unique additional demand for the First Class was a requirement of a year of experience for operators of shipboard and coast stations using Morse. This allowed the holder to be chief operator on board a passenger ship. However, since 1999 the use of satellite and very high-frequency maritime communications systems (GMDSS) has made them obsolete. (By that point meeting experience requirement for the First was very difficult.) Currently, only one class of license, the Radiotelegraph Operator License, is issued. This is granted either when the tests are passed or as the Second and First are renewed and become this lifetime license. For new applicants, it requires passing a written examination on electronic theory and radiotelegraphy practices, as well as 16 WPM codegroup and 20 WPM text tests. However, the code exams are currently waived for holders of Amateur Extra Class licenses who obtained their operating privileges under the old 20 WPM test requirement. Radio navigation aids such as VORs and NDBs for aeronautical use broadcast identifying information in the form of Morse Code, though many VOR stations now also provide voice identification. 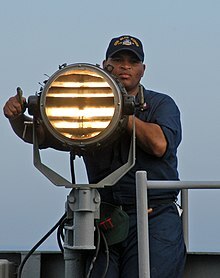 Warships, including those of the U.S. Navy, have long used signal lamps to exchange messages in Morse code. Modern use continues, in part, as a way to communicate while maintaining radio silence. An important application is signalling for help through SOS, "▄▄▄▄▄▄▄▄▄▄▄▄▄▄▄▄▄▄▄▄▄▄▄▄▄▄". This can be sent many ways: keying a radio on and off, flashing a mirror, toggling a flashlight, and similar methods. SOS is not three separate characters, rather, it is a prosign SOS, and is keyed without gaps between characters. Some Nokia mobile phones offer an option to alert the user of an incoming text message with the Morse tone "▄▄▄▄▄▄▄▄▄▄▄▄▄▄▄▄▄▄▄▄▄▄" (representing SMS or Short Message Service). In addition, applications are now available for mobile phones that enable short messages to be input in Morse Code. Morse code has been employed as an assistive technology, helping people with a variety of disabilities to communicate. For example, the Android operating system versions 5.0 and higher allow users to input text using Morse Code as an alternative to a keypad or handwriting recognition. Morse can be sent by persons with severe motion disabilities, as long as they have some minimal motor control. An original solution to the problem that caretakers have to learn to decode has been an electronic typewriter with the codes written on the keys. Codes were sung by users; see the voice typewriter employing morse or votem, Newell and Nabarro, 1968. Morse code can also be translated by computer and used in a speaking communication aid. In some cases, this means alternately blowing into and sucking on a plastic tube ("sip-and-puff" interface). An important advantage of Morse code over row column scanning is that once learned, it does not require looking at a display. Also, it appears faster than scanning. In one case reported in the radio amateur magazine QST, an old shipboard radio operator who had a stroke and lost the ability to speak or write could communicate with his physician (a radio amateur) by blinking his eyes in Morse. Two examples of communication in intensive care units were also published in QST, Another example occurred in 1966 when prisoner of war Jeremiah Denton, brought on television by his North Vietnamese captors, Morse-blinked the word TORTURE. In these two cases, interpreters were available to understand those series of eye-blinks. "A B C D E F G H I J K L M N O P Q R S T U V W X Y Z" in Morse code at 8 wpm. Morse code can be transmitted in a number of ways: originally as electrical pulses along a telegraph wire, but also as an audio tone, a radio signal with short and long tones, or as a mechanical, audible, or visual signal (e.g. a flashing light) using devices like an Aldis lamp or a heliograph, a common flashlight, or even a car horn. Some mine rescues have used pulling on a rope - a short pull for a dot and a long pull for a dash. Morse messages are generally transmitted by a hand-operated device such as a telegraph key, so there are variations introduced by the skill of the sender and receiver — more experienced operators can send and receive at faster speeds. In addition, individual operators differ slightly, for example, using slightly longer or shorter dashes or gaps, perhaps only for particular characters. This is called their "fist", and experienced operators can recognize specific individuals by it alone. A good operator who sends clearly and is easy to copy is said to have a "good fist". A "poor fist" is a characteristic of sloppy or hard to copy Morse code. The very long time constants of 19th and early 20th century submarine communications cables required a different form of Morse signalling. Instead of keying a voltage on and off for varying times, the dits and dahs were represented by two polarities of voltage impressed on the cable, for a uniform time. There is little point in learning to read written Morse as above; rather, the sounds of all of the letters and symbols need to be learned, for both sending and receiving. For commercial radiotelegraph licenses in the United States, the Federal Communications Commission specifies tests for Morse code proficiency in words per minute and in code groups per minute. The Commission specifies that a word is 5 characters long. The Commission specifies Morse code test elements at 16 code groups per minute, 20 words per minute, 20 code groups per minute, and 25 words per minute. The word per minute rate would be close to the PARIS standard, and the code groups per minute would be close to the CODEX standard. Morse Code cannot be treated as a classical radioteletype (RTTY) signal when it comes to calculating a link margin or a link budget for the simple reason of it possessing variable length dots and dashes as well as variant timing between letters and words. For the purposes of Information Theory and Channel Coding comparisons, the word PARIS is used to determine Morse Code's properties because it has an even number of dots and dashes. Morse Code, when transmitted essentially, creates an AM signal (even in on/off keying mode), assumptions about signal can be made with respect to similarly timed RTTY signalling. Because Morse code transmissions employ an on-off keyed radio signal, it requires less complex transmission equipment than other forms of radio communication. The ARRL has a readability standard for robot encoders called ARRL Farnsworth Spacing that is supposed to have higher readability for both robot and human decoders. Some programs like WinMorse have implemented the standard. People learning Morse code using the Farnsworth method are taught to send and receive letters and other symbols at their full target speed, that is with normal relative timing of the dots, dashes, and spaces within each symbol for that speed. The Farnsworth method is named for Donald R. "Russ" Farnsworth, also known by his call sign, W6TTB. However, initially exaggerated spaces between symbols and words are used, to give "thinking time" to make the sound "shape" of the letters and symbols easier to learn. The spacing can then be reduced with practice and familiarity. Another popular teaching method is the Koch method, named after German psychologist Ludwig Koch, which uses the full target speed from the outset but begins with just two characters. Once strings containing those two characters can be copied with 90% accuracy, an additional character is added, and so on until the full character set is mastered. In the United Kingdom, many people learned the Morse code by means of a series of words or phrases that have the same rhythm as a Morse character. For instance, "Q" in Morse is dah-dah-di-dah, which can be memorized by the phrase "God save the Queen", and the Morse for "F" is di-di-dah-dit, which can be memorized as "Did she like it." A well-known Morse code rhythm from the Second World War period derives from Beethoven's Fifth Symphony, the opening phrase of which was regularly played at the beginning of BBC broadcasts. The timing of the notes corresponds to the Morse for "V", di-di-di-dah, understood as "V for Victory" (as well as the Roman numeral for the number five). Single-line display may use printed "+"
Prosigns for Morse code are special (usually) unwritten procedural signals or symbols that are used to indicate changes in communications protocol status or white space text formatting actions. There is no standard representation for the exclamation mark (! ), although the KW digraph (▄▄▄▄▄▄▄▄▄▄▄▄▄▄▄▄▄▄▄▄▄▄) was proposed in the 1980s by the Heathkit Company (a vendor of assembly kits for amateur radio equipment). While Morse code translation software prefers the Heathkit version, on-air use is not yet universal as some amateur radio operators in North America and the Caribbean continue to prefer the older MN digraph (▄▄▄▄▄▄▄▄▄▄▄▄▄▄▄▄) carried over from American landline telegraphy code. The representation of the & sign given above, often shown as AS, is also the Morse prosign for wait. In addition, the American landline representation of an ampersand was similar to "ES" (▄▄▄▄▄▄▄▄▄▄▄) and hams have carried over this usage as a synonym for "and" (WX HR COLD ES RAINY, "the weather here is cold & rainy"). On May 24, 2004 — the 160th anniversary of the first public Morse telegraph transmission — the Radiocommunication Bureau of the International Telecommunication Union (ITU-R) formally added the @ ("commercial at" or "commat") character to the official Morse character set, using the sequence denoted by the AC digraph (▄▄▄▄▄▄▄▄▄▄▄▄▄▄▄▄▄▄▄▄). For Chinese, Chinese telegraph code is used to map Chinese characters to four-digit codes and send these digits out using standard Morse code. Korean Morse code uses the SKATS mapping, originally developed to allow Korean to be typed on western typewriters. SKATS maps hangul characters to arbitrary letters of the Latin script and has no relationship to pronunciation in Korean. For Russian and Bulgarian, Russian Morse code is used to map the Cyrillic characters to four-element codes. Many of the characters are encoded the same way (A, O, E, I, T, M, N, R, K, etc.). Bulgarian alphabet contains 30 characters, which exactly match all possible combinations of 1, 2, 3, and 4 dots and dashes. Russian requires 1 extra character, "Ы" which is encoded with 5 elements. During early World War I (1914–1916), Germany briefly experimented with 'dotty' and 'dashy' Morse, in essence adding a dot or a dash at the end of each Morse symbol. Each one was quickly broken by Allied SIGINT, and standard Morse was restored by Spring 1916. Only a small percentage of Western Front (North Atlantic and Mediterranean Sea) traffic was in 'dotty' or 'dashy' Morse during the entire war. In popular culture, this is mostly remembered in the book The Codebreakers by Kahn and in the national archives of the UK and Australia (whose SIGINT operators copied most of this Morse variant). Kahn's cited sources come from the popular press and wireless magazines of the time. ^ a b c d "International Morse code Recommendation ITU-R M.1677-1". itu.int. International Telecommunication Union. October 2009. Archived from the original on 6 November 2012. Retrieved 23 December 2011. ^ Fahie, John Joseph (1884). A History of Electric Telegraphy, to the Year 1837 (PDF). E. & F.N. Spon. Archived (PDF) from the original on 15 July 2017. Retrieved 21 November 2017. ^ Freebody 1959, pp. 28-29. ^ "Learning Morse Code". Arrl.org. Archived from the original on 20 September 2017. Retrieved 1 December 2017. ^ L. Peter Carron, "Morse Code: The Essential Language", Radio amateur's library, issue 69, American Radio Relay League, 1986 ISBN 0-87259-035-6. ^ R. J. Eckersley, Amateur radio operating manual, Radio Society of Great Britain, 1985 ISBN 0-900612-69-X. ^ Captain Linwood S. Howeth (1963). History of Communications-Electronics in the United States: Early Navy Efforts to Develop Aircraft Radio Navy. ^ "K2TQN Vintage Radio Column". K2tqn.com. Archived from the original on 11 September 2017. Retrieved 1 December 2017. ^ a b "How the Zeppelin Raiders Are Guided by Radio Signals". Popular Science Monthly. April 1918. pp. 632–634. Retrieved March 4, 2018. ^ "An obituary for Morse code" Archived 2017-03-30 at the Wayback Machine, The Economist, January 23, 1999. ^ "Maritime Radio Historical Society". radiomarine.org. Archived from the original on 25 January 2018. Retrieved 1 December 2017. ^ "Morse code training in the Air Force". Swling.com. 10 December 2015. Archived from the original on 2 July 2017. Retrieved 1 December 2017. ^ "Amendments to the International Aeronautical and Maritime Search and Rescue (IAMSAR) Manual" (PDF). Uscg.mil. Retrieved 1 December 2017. ^ a b "Radiotelegraph Operator License (T)". fcc.gov. Federal Communications Commission. Archived from the original on January 13, 2015. Retrieved January 21, 2015. ^ "Maritime Radio Historical Society". radiomarine.org. Archived from the original on 9 October 2017. Retrieved 1 December 2017. ^ Perera, Tom. "The "Morse" Code and the Continental Code". W1TP Telegraph & Scientific Instruments Museums. Archived from the original on 9 December 2011. Retrieved 23 December 2011. ^ a b "The Art & Skill of Radio Telegraphy" (PDF). 2002. Archived (PDF) from the original on 2012-02-26. Retrieved 2013-06-14. ^ "Extremely High Speed Club official web page". Morsecode.nl. Archived from the original on 28 June 2017. Retrieved 1 December 2017. ^ "Chapter 1. Air Navigation". faa.gov. January 3, 2015. Archived from the original on December 1, 2014. Retrieved January 21, 2015. ^ "WG - WINNIPEG". Pilotnav.com. Archived from the original on 2 December 2017. Retrieved 1 December 2017. ^ "Italy Joins No-Code Ranks as FCC Revives Morse Debate in the US". The ARRL Letter. 24 (31). August 12, 2005. Archived from the original on November 5, 2011. Retrieved 2012-04-02. ^ "1998 Biennial Regulatory Review — Amendment of Part 97 of the Commission's Amateur Service Rules" (PDF). Archived from the original (PDF) on October 31, 2005. Retrieved December 4, 2005. ^ "Aeronautical Information Manual (AIM)". Archived from the original on September 4, 2009. Retrieved 2007-12-10. ^ "Prosigns". Qsl.net. QTH.Com. Archived from the original on September 24, 2015. Retrieved January 21, 2015. ^ "#FactsOnly: The Most Interesting Things You Didn't Know About Nokia". Complex. Retrieved 2018-05-13. ^ Nokia files patent for Morse Code-generating cellphone Archived 2017-06-25 at the Wayback Machine, 12 March 2005, Engadget. ^ "Android Accessibility Help: Use Morse Code". Google. 2018. Retrieved 21 December 2018. ^ Dennis W. Ross, "Morse Code: A Place in the Mind," QST, March, 1992, p. 51. ^ Ronald J. Curt, "In the Blink of an Eye," QST, July 1990 p. 44. ^ Donna Burch, "Morse Code from the Heart," QST July 1990 p. 45. ^ "Fastest speed for a morse code transmission". Guinnessworldrecords.com. Archived from the original on 3 July 2017. Retrieved 1 December 2017. ^ "A Standard for Morse Timing Using the Farnsworth Technique" (PDF). Arrl.org. Archived (PDF) from the original on 25 January 2018. Retrieved 1 December 2017. ^ "Custom Farnsworth Spacing Configuration". Winmorse.com. Archived from the original on 2016-03-04. Retrieved 2013-11-21. ^ Glenn Stanley, The Cambridge Companion to Beethoven, p.269, Cambridge University Press, 2000 ISBN 0-521-58934-7. ^ William Emmett Studwell, The Americana Song Reader, p.62, Routledge, 1997 ISBN 0-7890-0150-0. ^ "International Morse Code Gets a New ITU Home, New Character". Archived from the original on September 30, 2007. Retrieved February 27, 2007. ^ Wythoff, Grant (July 2014). "The Invention of Wireless Cryptography". The Appendix: Futures of the Past. 2 (3). Archived from the original on 2014-12-08. Retrieved 2015-01-28. ^ "Fractionated Morse, and Other Oddities". Quadibloc.com. Retrieved 2013-11-21. ^ "Welcome! - Reverse Beacon Network". Reversebeacon.net. Archived from the original on 12 September 2017. Retrieved 1 December 2017. ^ "Morse Decoder Test – iPhone / iPad | Gerolf Ziegenhain". Gerolfziegenhain.wordpress.com. 2013-05-20. Archived from the original on 2017-07-27. Retrieved 2016-09-17. Freebody, J. W. (1959), "Historical Survey of Telegraphy", Telegraphy, London: Sir Isaac Pitman & Sons, Ltd.
"Everyone Knows Morse". TV Tropes. . Includes a list of uses and appearances of Morse Code in movies, television episodes, and other popular culture.